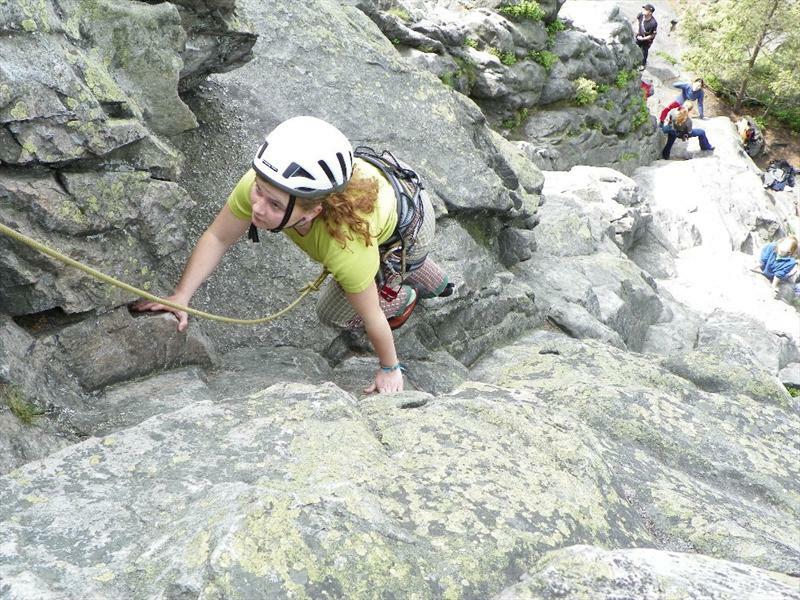 SINGING ROCK is climbing and we live up to this motto. 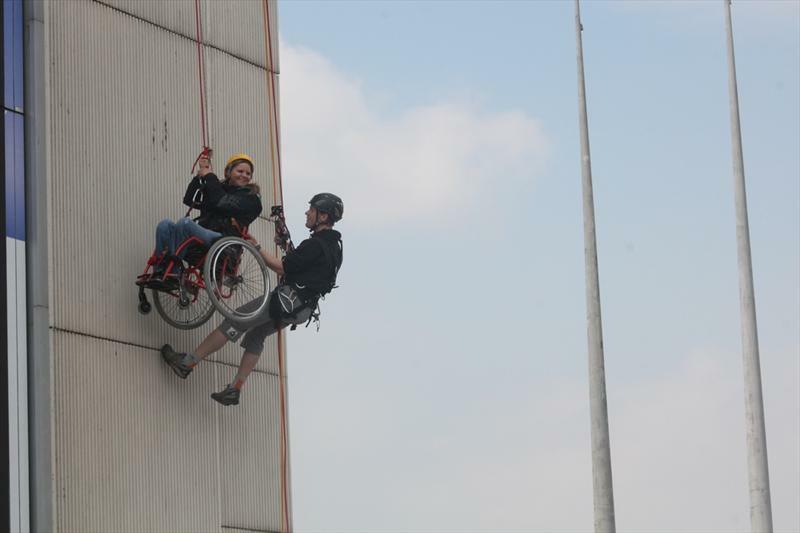 Our staff beside climbing has decided to support also the handicapped athletes who wish to climb and be part of the climbing comunity. 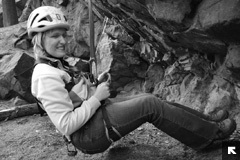 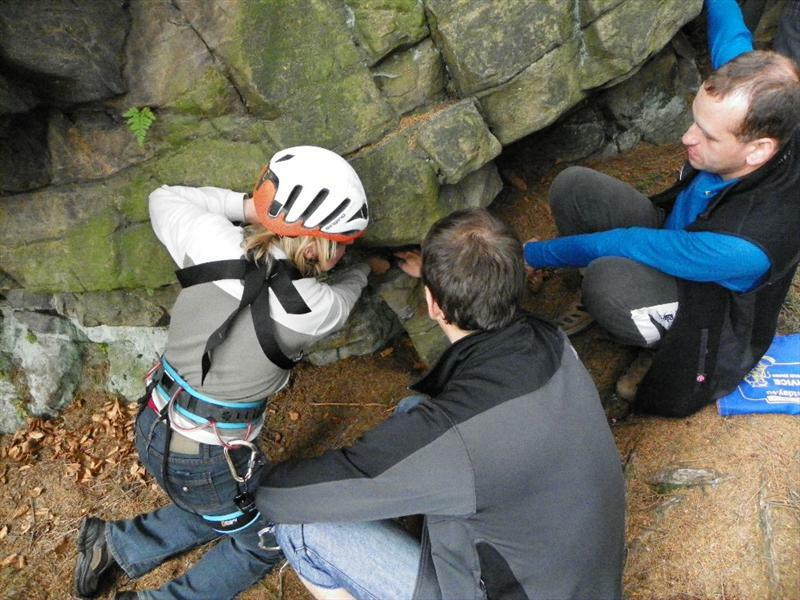 The purpose of the supported events is to let handicapped climbers to become more independently while climbing. 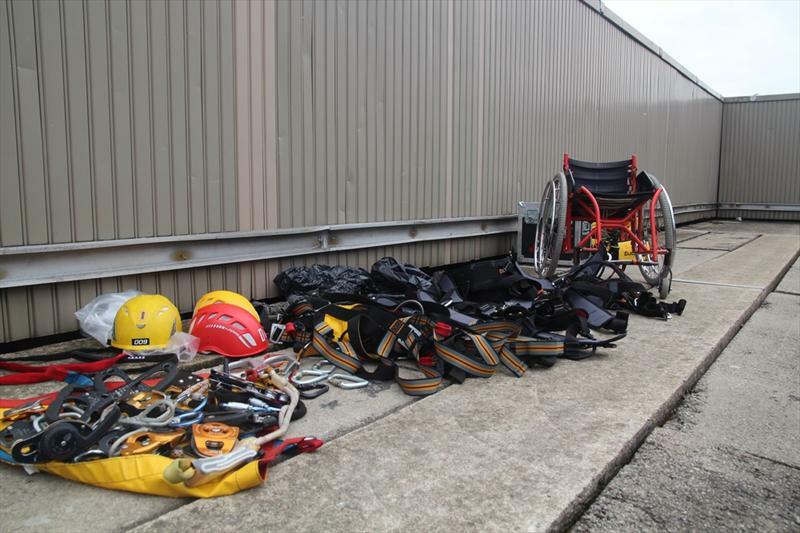 That will cause less people to assist their climbing activities and to involve handicapped climbers inside the climbing clubs and comunity. 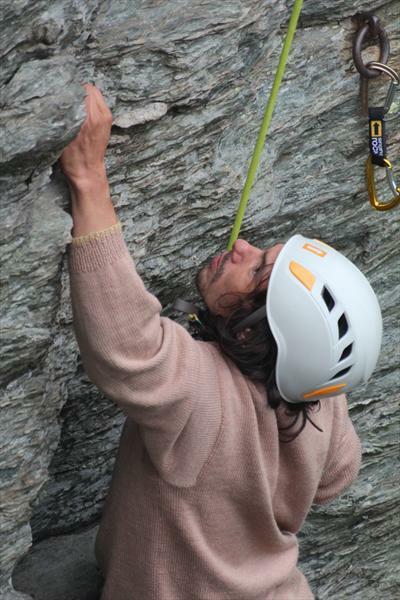 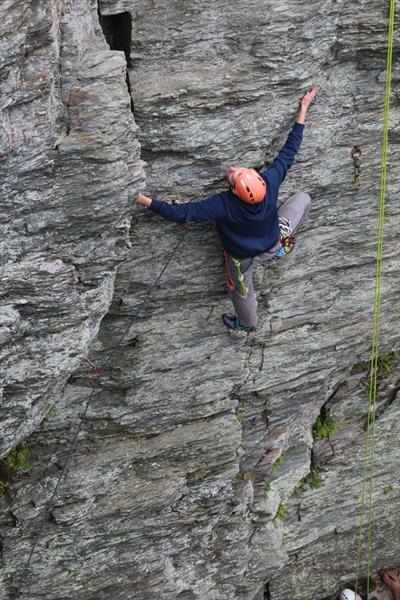 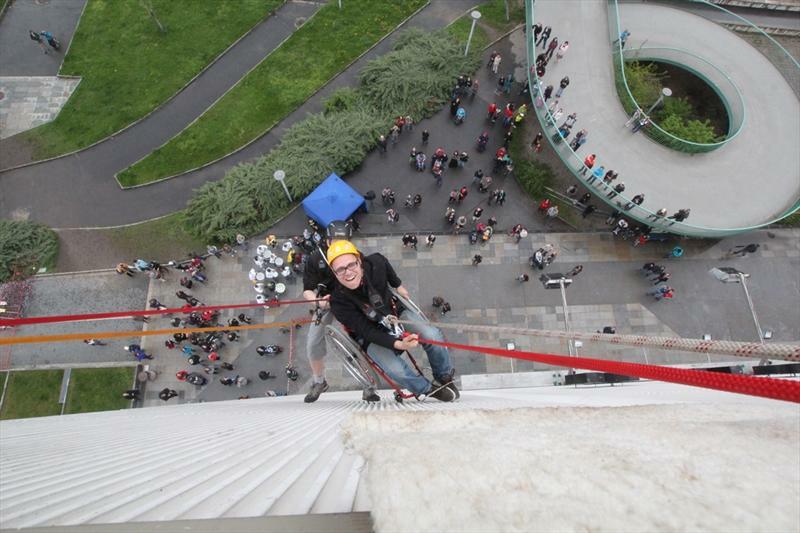 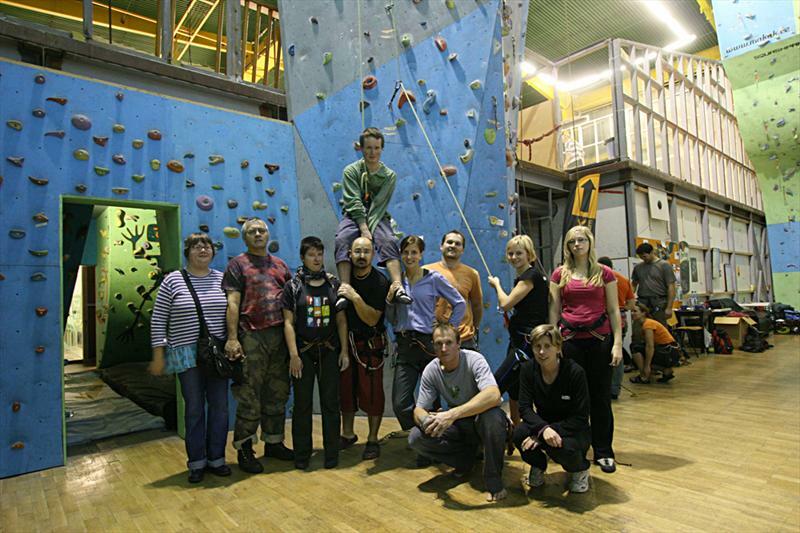 The 10th year of the HandiCamp climbing event, organized by Singing Rock and the Masaryk University’s Teiresias Centre, took place at the weekend of 2 - 4 October 2015. 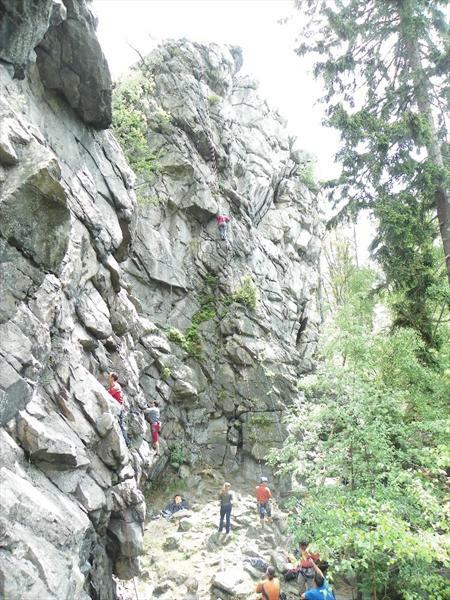 After years we were back to a proven site in Vysocina, close to Dratnik and Ctyri palice. 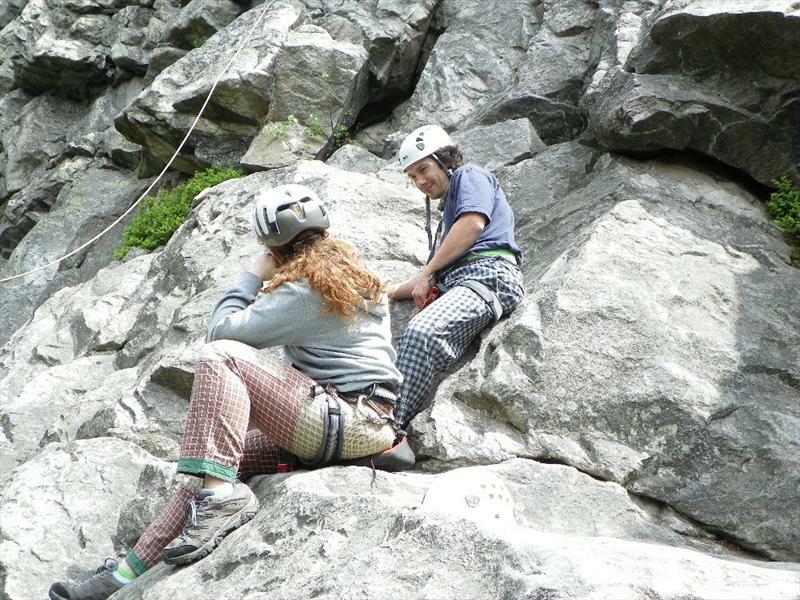 This is, to a place where climbing can be enjoyed not only by beginners but also advanced climbers. 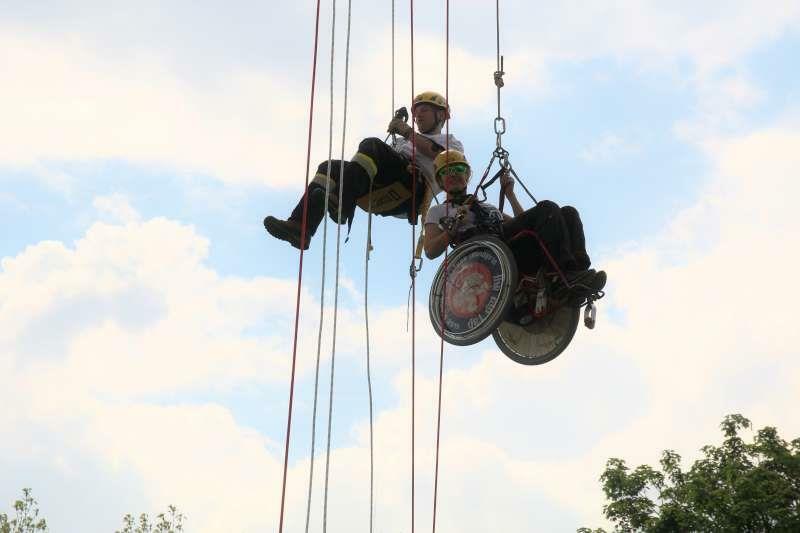 SINGING ROCK supported another GENERALI SURVIVAL, the 24 hours outdoor race for paraplegic and athletes without handicap, which was traditionally held in Poněšice (near Hluboká nad Vltavou), Czech Republic, on 12th-14th June 2015. 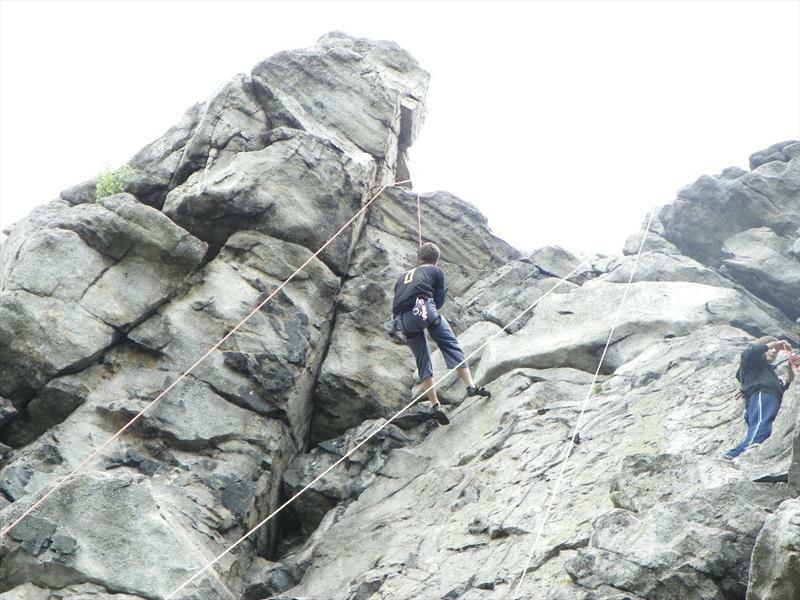 It was a demanding and amazing competition again. 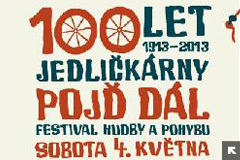 SINGING ROCK, as in previous years, supported the 3rd year of Pojď dál, the beneficent festival which took place on 1st May 2015 in Prague. 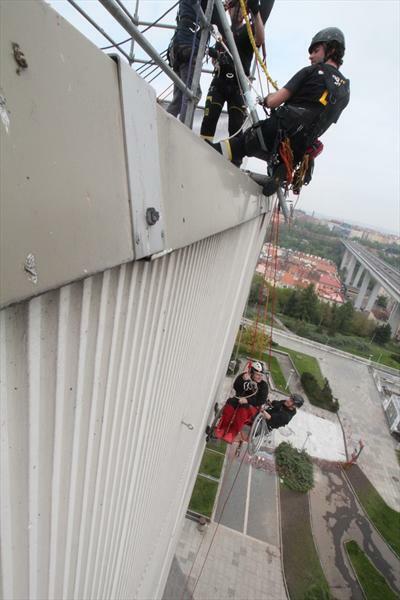 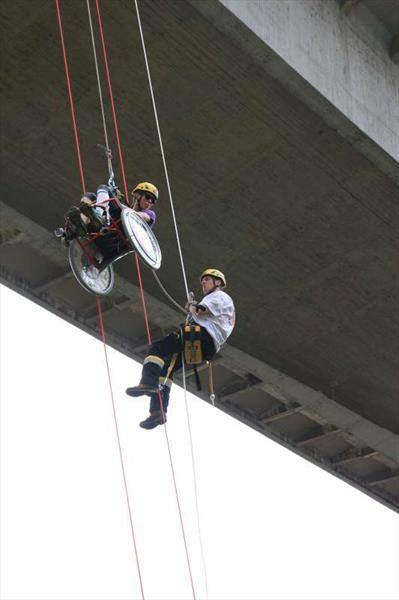 The event started with the abseiling of the 42.5 m high Nusle Bridge on wheelchair again.The aim of the festival was to support the fund which will finance completion of the construction of the Jedlička Institute and Schools for physically disabled young people (more info at www.sbirkajus.cz). 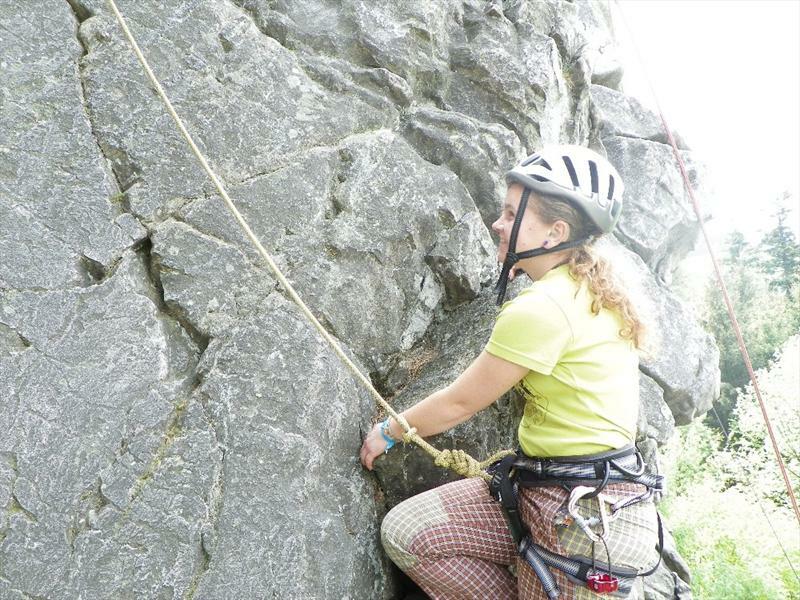 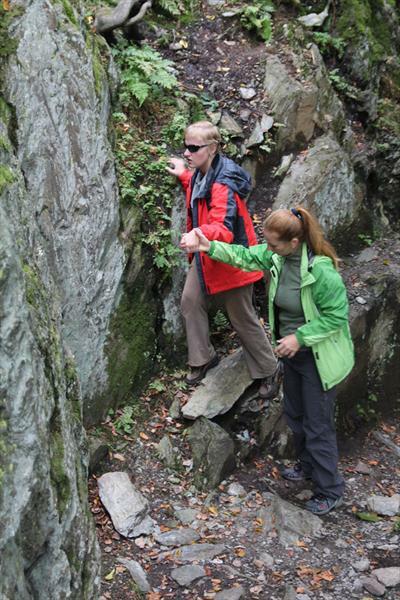 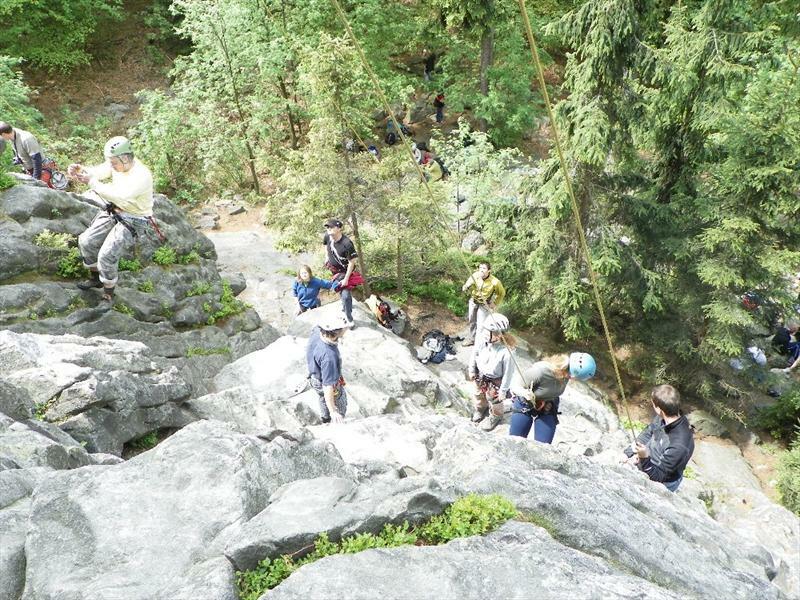 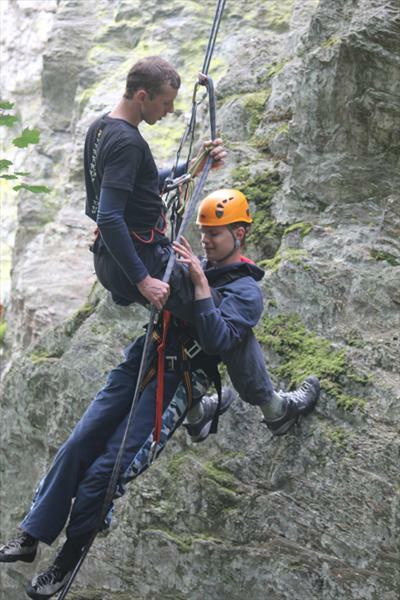 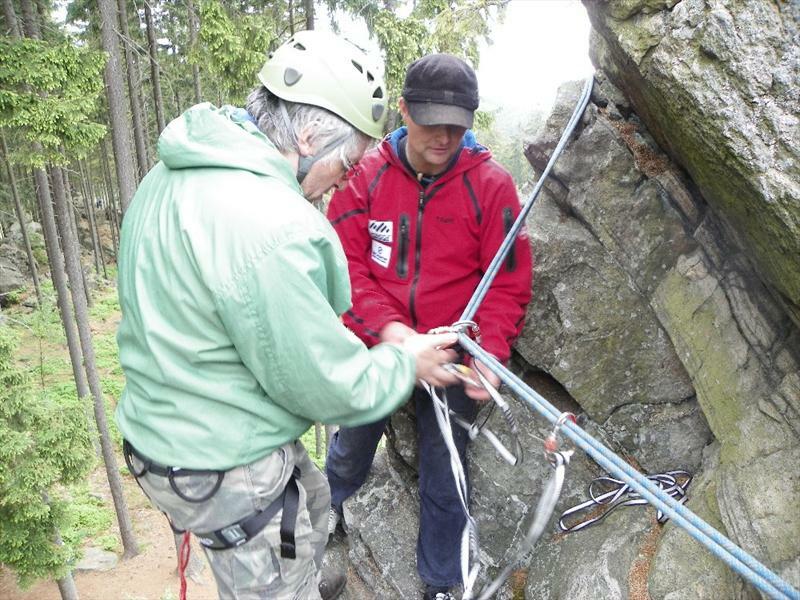 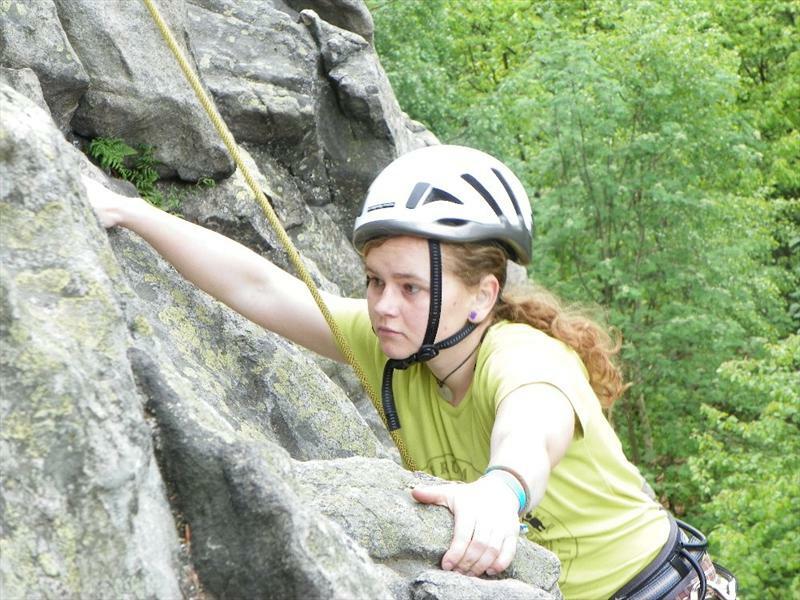 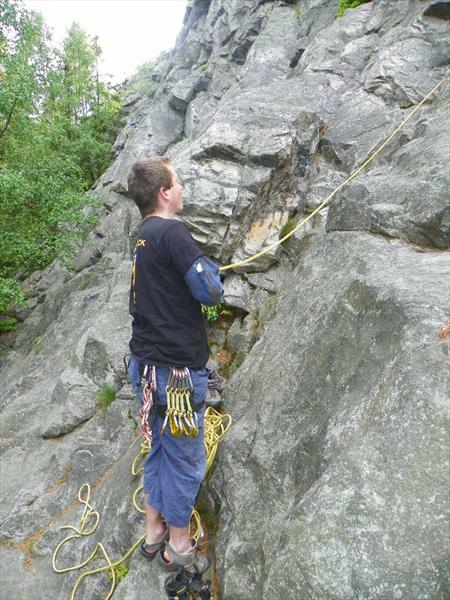 The 8th annual meeting with disabled climbers, HandiCamp, took place at Čertovy kameny at Jesenik, Czech Republic, during the weekend 12th - 14th September 2014. 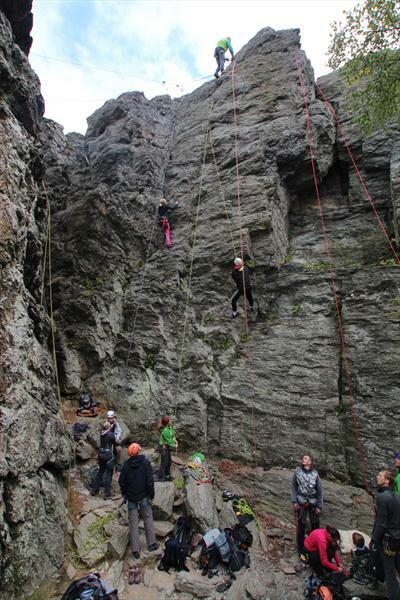 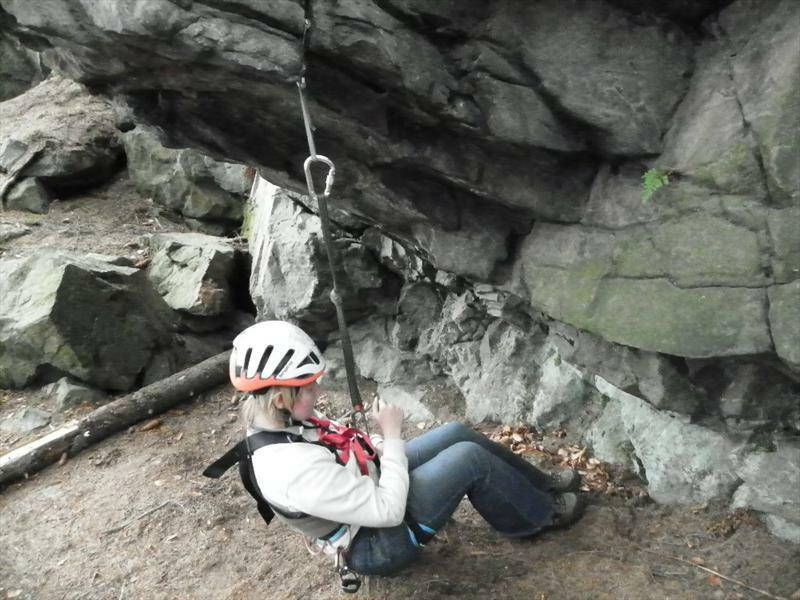 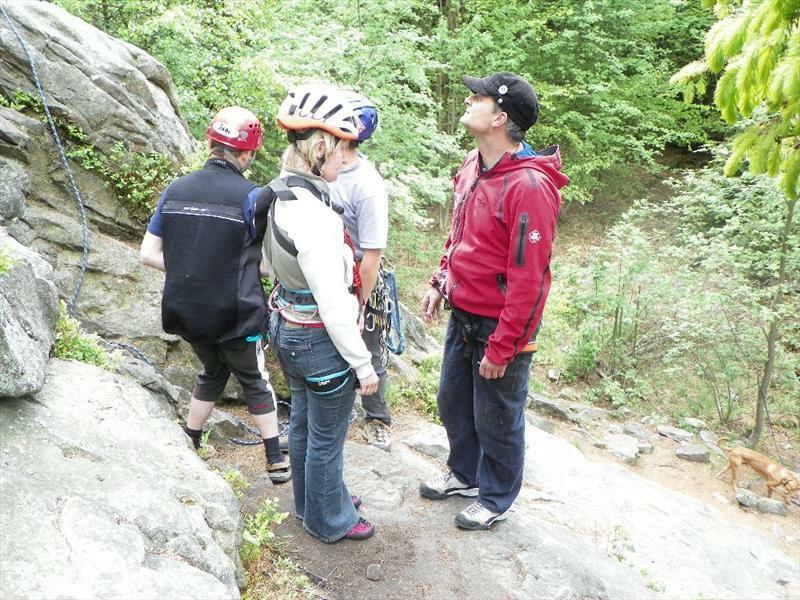 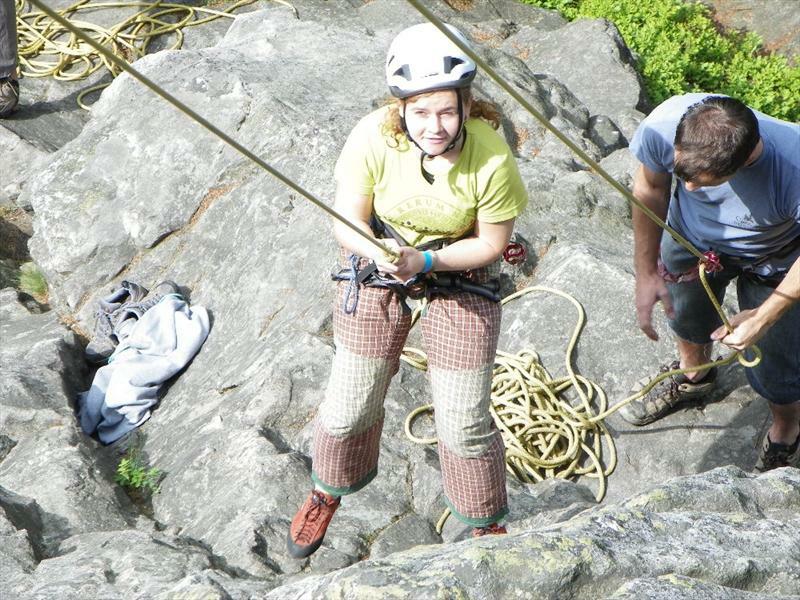 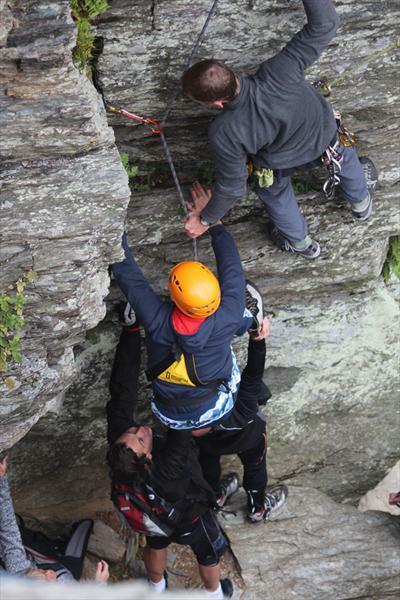 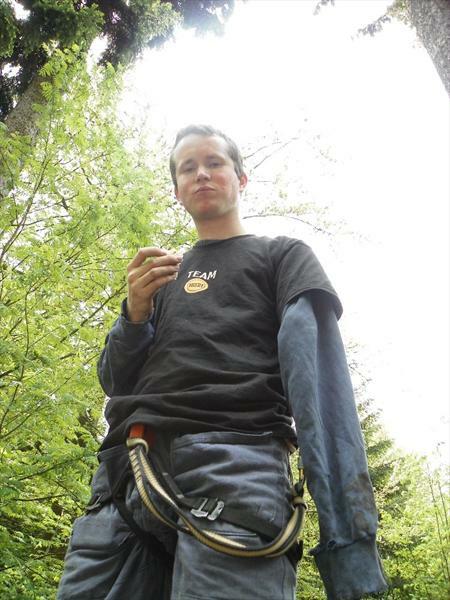 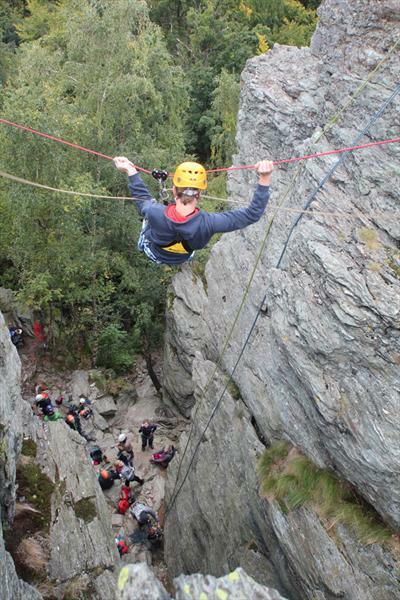 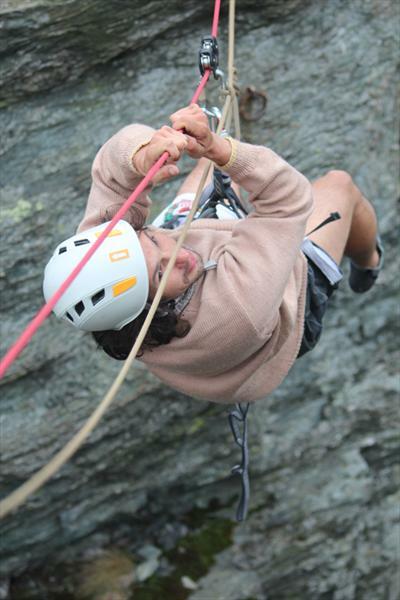 Even that the weather wasn´t the best one, everybody enjoyed climbing, rappelling and also caveing. 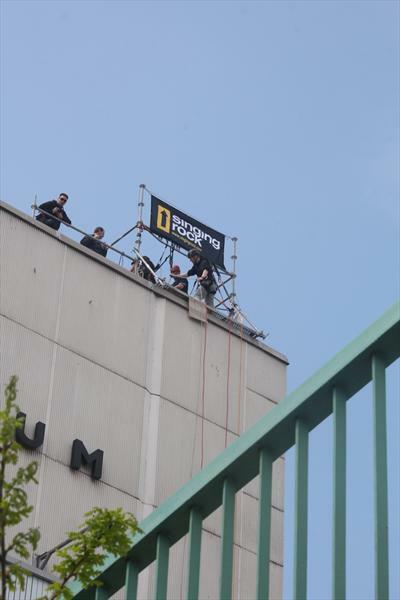 Thanks for coming and see you next year. 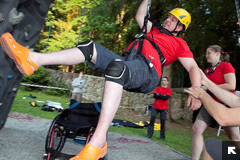 SINGING ROCK also in 2014 supported Generali SURVIVAL, the Czech Open Academic Championship in Outdoor Mixed Biathlon, 13th annual & 5th year for wheelchair-bound athletes. 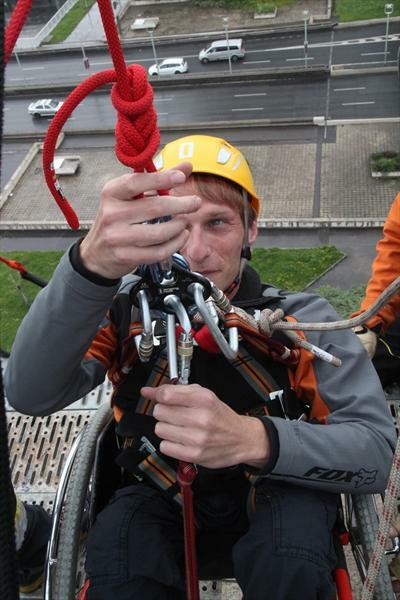 The 24 hours outdoor race for paraplegic and athletes without handicap took place in June in Poněšice near Hluboká nad Vltavou, Czech Republic. 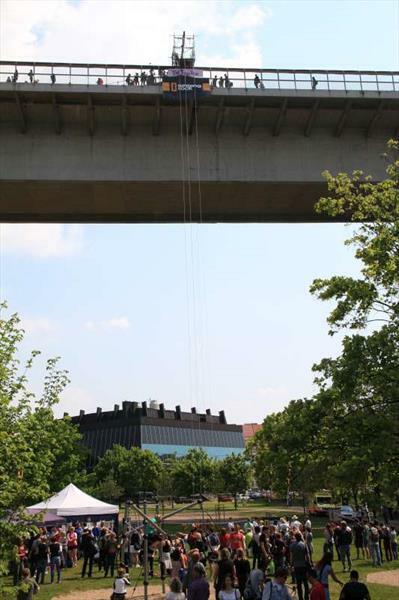 Look at photos from that unique event. 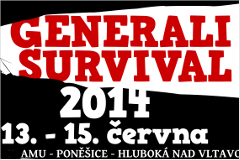 At the beginning of May 2014 SINGING ROCK supported the beneficent festival "Pojď dál". 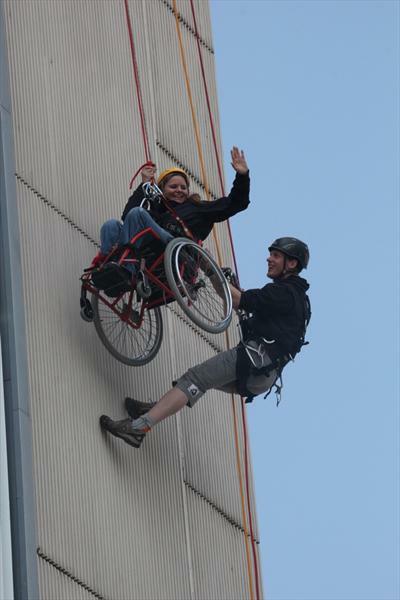 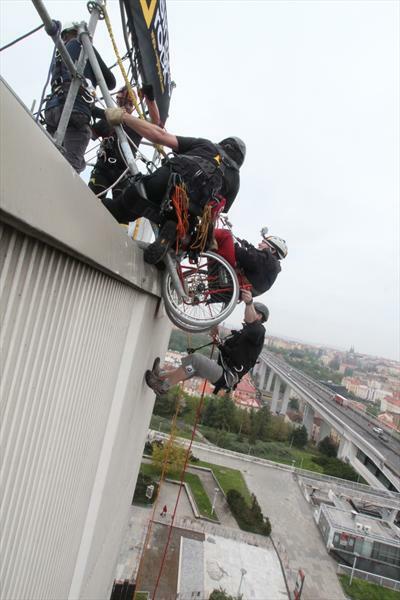 One part of this event was the abseiling of the Prague's Nusle Bridge on wheelchair under the lead of SINGING ROCK Team. 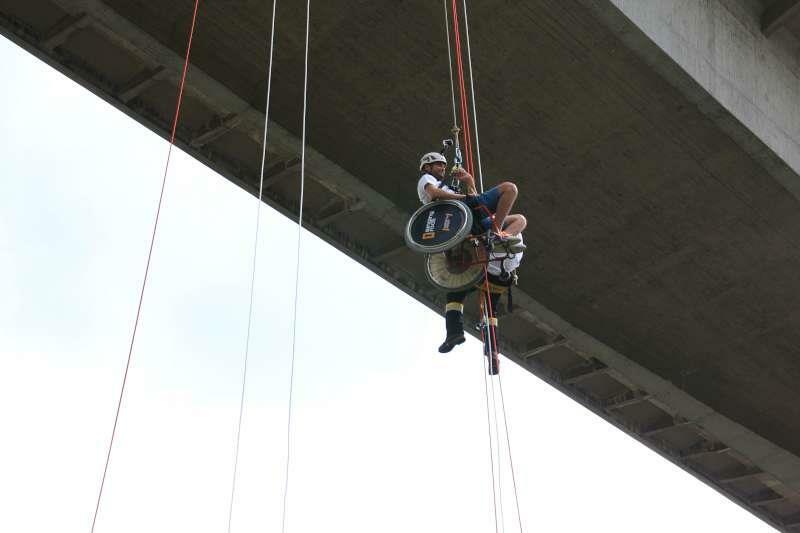 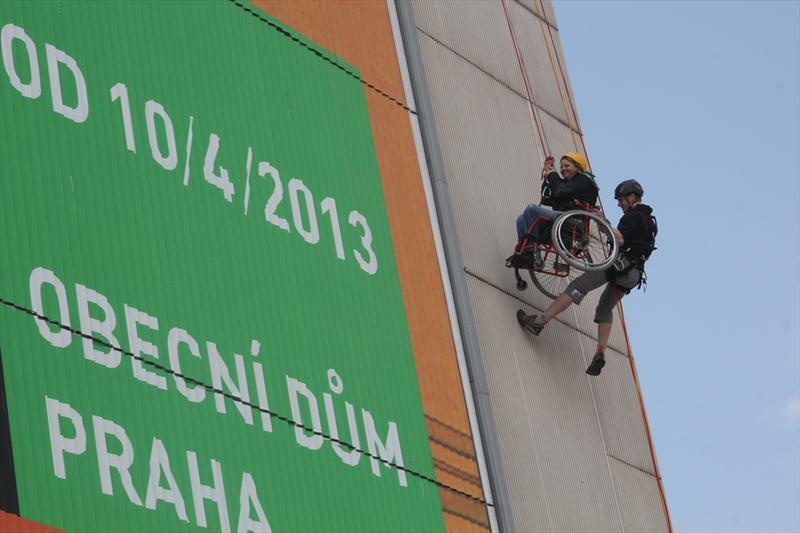 The abseil from the 42.5 m high bridge was done by wheelchair users and Czech celebrities. 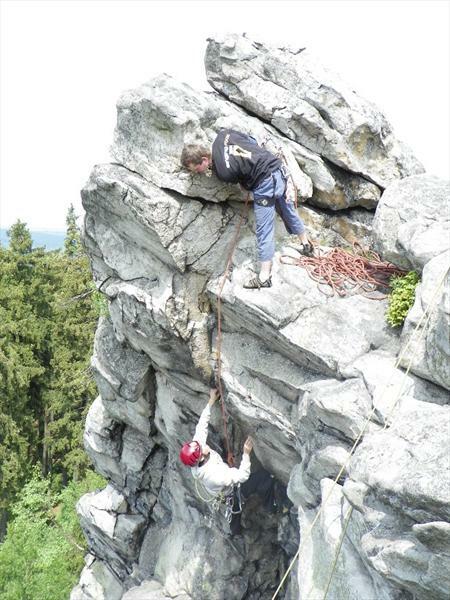 SINGING ROCK in cooperation with Teiresias invites you on the weekend event designed especially (but not only) for climbers and mountaineers with disabilities, HandiCamp VII., 31st May - 2nd June 2013, Tábor, Czech republic. 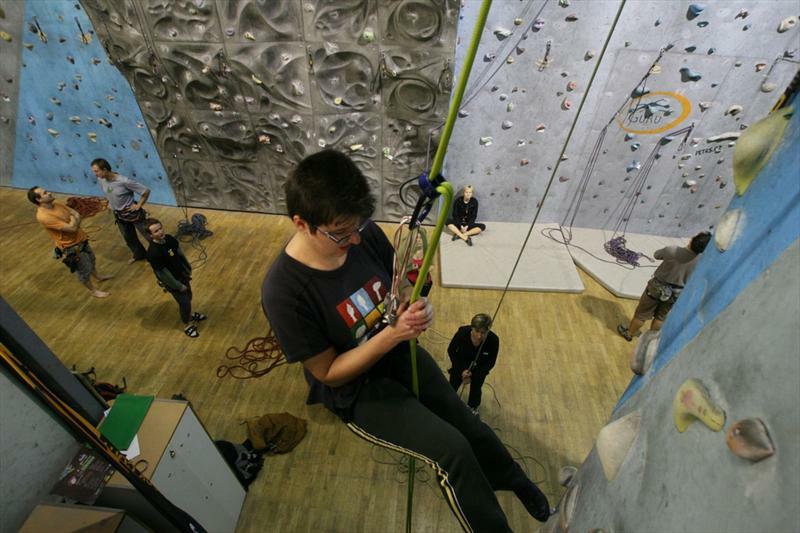 SINGING ROCK in cooperation with Teiresias (Support Centre for Students with Special Needs at Masaryk University) and HO Matahari prepared a weekend event designed especially (but not only) for climbers and mountaineers with disabilities. 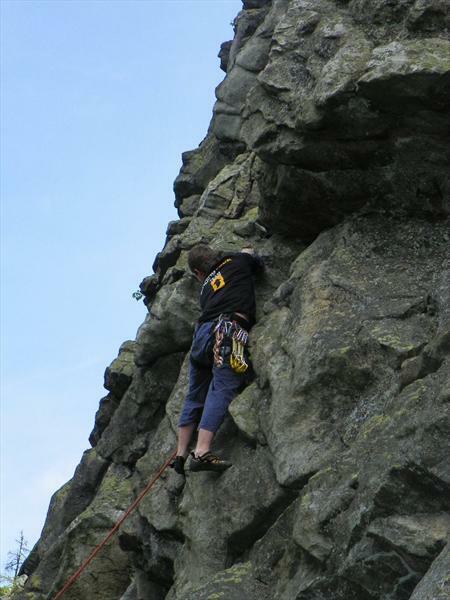 The place of this, already 6th Handicamp, was at the climbing area Rabštejn in the Jeseníky mountains. 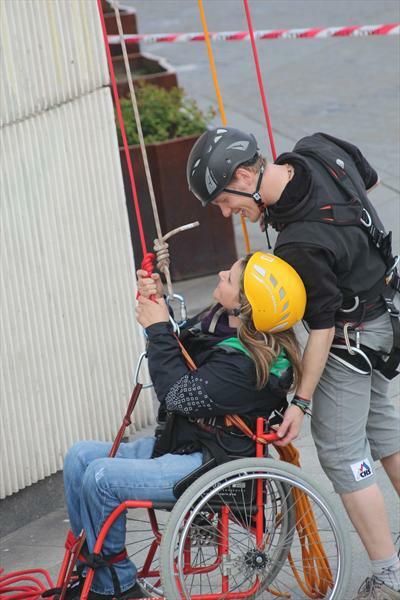 11th annual Survival - No Limits - OPEN National Championship in outdoor mixed teams & 2nd year race for wheelchair/bound athletes without a handicap, June 8th – 10th 2012, Poněšice near Hluboká nad Vltavou, České Budějovice, Czech Republic. 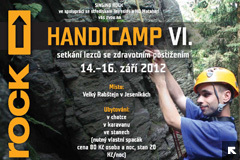 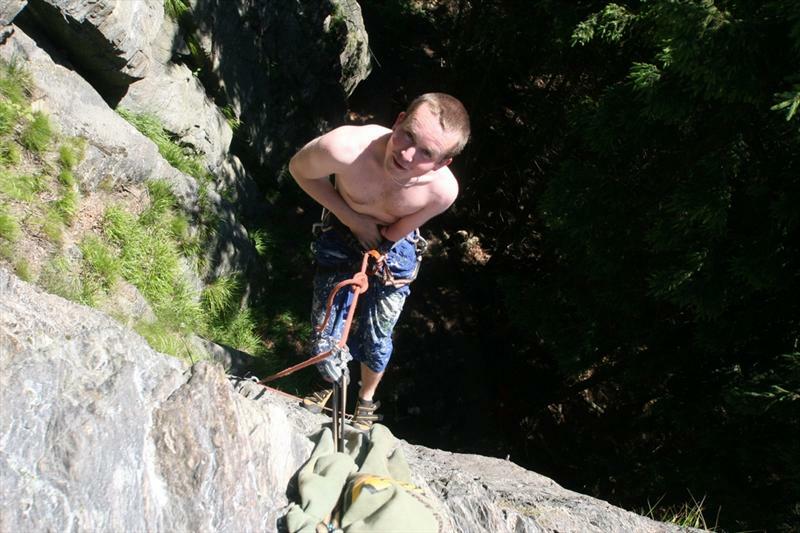 5th meeting with disabled climbers at Vysocina, Blatiny, 15th - 16th May 2011. 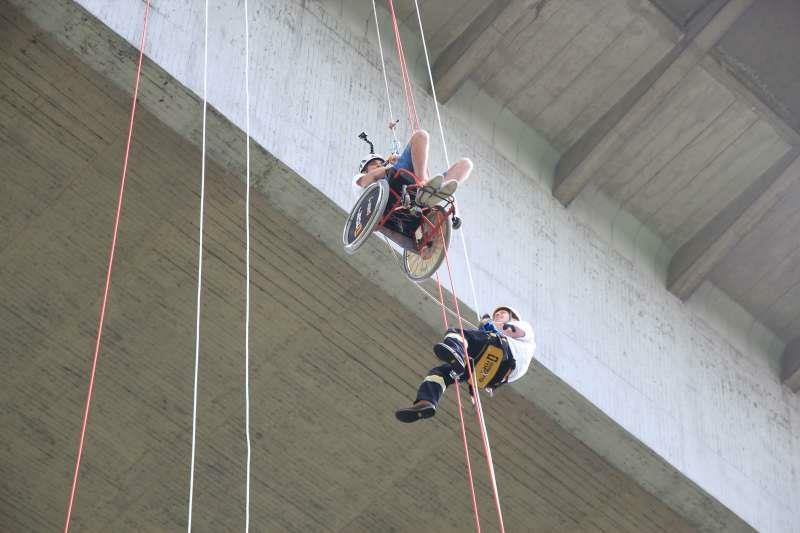 This time it was a first time when there were climbers with various disabilities - sightless, deaf and climbers with amputated limbs.